SURIGAO CITY – For Senator Francis “Chiz” Escudero the heart of the Sabah issue is that the Philippines should not drop its claim to the disputed territory because “it is ours”, but the senators should let President Benigno S. Aquino III handle the crisis on his own. 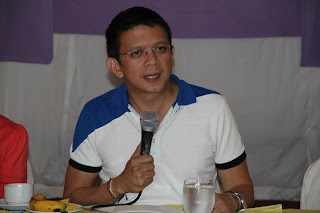 Alluding to his colleagues who like him are seeking reelection, Escudero today said in a campaign sortie here that making further statements could only muddle the issue. “I once said ‘wag nang sawsawan ng mga senador ang isyu ng Sabah. Foreign policy is within the sole domain of the President while the role of the Senate is to ratify treaties,” he said. “I would prefer that we speak with one voice through the President and not act like we’re washing our dirty linen in public while some candidates utter inanities, dip their fingers into the issue to get popular, get publicized, forgetting that the lives of Filipinos and national interest are at stake here,” he said in Filipino. Escudero, however, stressed that the country should pursue the Sabah claim because “it is ours”. “For me, Sabah is ours. But we have to choose the time when we can advance and fight for it. What is important is we should not let it go and turn our backs on whatever is our claim,” he said. He said he agrees with the intent of the President to resolve the issue while averting another conflict and without having to sacrifice more lives. But he said the ongoing crisis in Sabah that included reports of human rights abuses committed by Malaysian authorities against Filipinos should serve as a “wakeup call for us”. An estimated 800,000 Filipinos are said to be living in Sabah now, Escudero said. “The lives of Filipinos are important but we must also take into consideration the responsibility of the President over the interest of the majority,” Grace Poe-Llamanzares, Escudero’s fellow candidate under the administration coalition Team PNoy, said in apparent reference to criticisms that the President seemed to be deferring to Malaysia each time he spoke on Sabah.